Boca Iglesia is a hidden archaeological site located deep in the Northeastern region of the Yucatan Peninsula in the National Park Yum Balam. The area is marked by local and regional history based on its crucial position in the Mayan salt trade routes as well as being the site of the first christian building to have been built in the Quintana Roo region of Mexico. Our knowledgeable crew leads the expedition through the mangroves and into the jungle to discover what few have experienced: the untouched ruins of a Spanish church built in the early 1500’s. 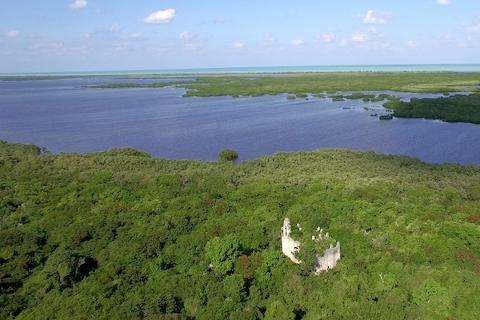 The area surrounding the site is uninhabited, the only way to reach this magical place is by way of nautical navigation 40 kilometers from Isla Mujeres. Collaborating with local fisherman in the area, we provide an incredible opportunity to glimpse the past, explore Mayan culture and live the untold history of the first Spanish settlers in the Yucatan. Discover the flora, fauna and travel in time to the first church in the region. IMPORTANT: We are at the mercy of sea and weather conditions. We highly recommend to stay at least two days on the island for a better weather window.